Here are the games published in 2010 that I have played, and ranked according to how eager I am to play them now. Nothing very scientific. One game being above another doesn't mean it's "better" (whatever that means). It just means I'm probably more likely to pick it to play. It's an interesting exercise to try to rank these games. Maybe you'll find it interesting too. I exclude expansions, but I'll talk a little about some of them further down. 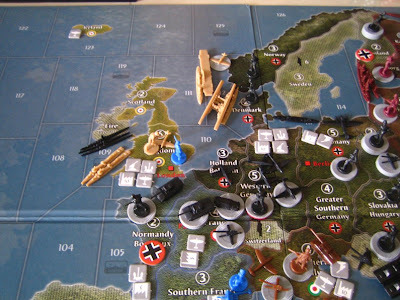 Axis & Allies Europe 1940 - I actually have not played this game even once, so I'm keen to play it. I've only played Axis & Allies Global 1940, which combines the Europe 1940 and Pacific 1940 games. It feels a bit too long for the enjoyment I get out of it, so I suspect I will like the theatre-specific games being played by themselves. Innovation - I'm getting comfortable with this game. The expansion Echoes of the Past adds some interesting elements, but I am quite happy with the base game and am in no hurry to expand it. Allen has bought the expansion and we have played a few times. Merchants & Marauders - The game feels very open, much like the PC game Sid Meier's Pirates. I prefer to play to a higher number of Glory points than the standard game. It gives a fuller experience. First Train to Nuremberg - I think I am going to break down and buy this. Managing the game components is a little tedious, but I like how the game requires careful planning, and there is a certain story arc to it, where you try to earn fast money and then eventually you need to plan to sell off your rail network to suckers. 7 Wonders - There is luck. There is set collection. There is no particular innovation. There is a mesh of familiar mechanisms. But somehow this game is a lot of fun. It's an adjustable-depth game - you can think a lot and plan a lot and calculate a lot, but you can also play by gut feel (and still win). Axis & Allies Europe 1940. I really need to play this. 51st State - Not much player interaction, but I like how you need to constantly plan for replacing cards already played because the points-generating cards have limited capacity and quickly get used up. Sid Meier's Civilization: The Board Game - Lots of civ elements, which is fun. But this game is a sprint and not a marathon. In the early game you can explore various paths, but by around mid game you'll need to decide on which victory condition to go for, maybe with one back-up plan if Plan A doesn't work out. You don't really experience the rise-and-fall feeling like in Civilization and Through the Ages. But still, a pretty good game. Earth Reborn - Interesting scenarios and rich story. I have only done half of the learning scenarios, so I don't know the full game yet. Inca Empire - Network building, blocking, and playing good and bad event cards that always affect two players. 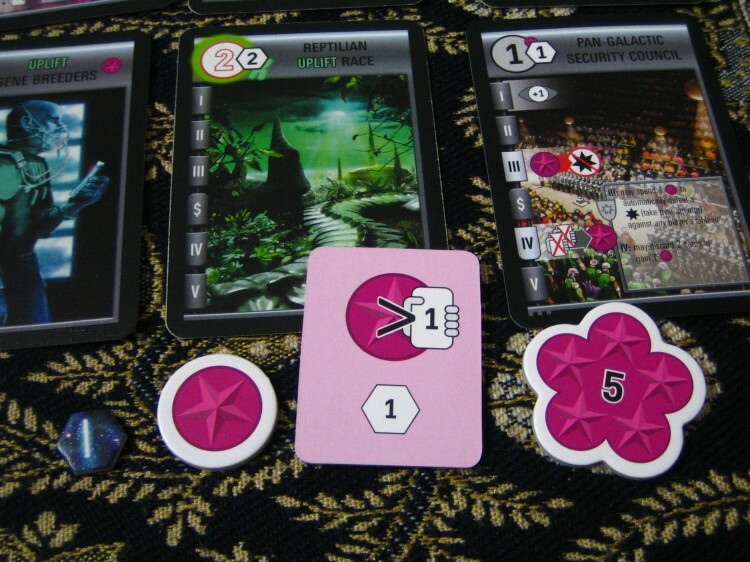 Alien Frontiers - Complexity level feels like The Settlers of Catan. You develop and colonise. An impressive effort from a new designer and publisher team. Haggis - Climbing card game (like Big Two) that works with 2 or 3. I have only played with 2. Surprisingly that session was very funny. Learning the tricks and exploring the strategies in the game were fun. Zombie State: Diplomacy of the Dead - More an experience game than a strategy game, but it's fun to try to survive a zombie apocalypse and to direct your nation at a strategic level. Labyrinth: The War on Terror, 2001-? - Long game. Hard decisions. Long-term planning and patience is required to achieve anything significant. The two sides are very asymmetrical. Actions are completely different, it's not just about having different strengths and weaknesses. Washington's War - Relatively quick CDG. Evolution: The Origin of Species - The formula of focusing on one super specie seems the best strategy. If I'm right about this then the game becomes rather one-dimensional strategy-wise. This is a light card game, the fun being in creating species with interesting combinations of abilities, the ongoing struggle between hunter and prey, and the game of survival when food is scarce. Merchants of the Middle Ages (I played Die Handler, the earlier version) - Requires negotiation and cooperation. Overall a well-crafted game. 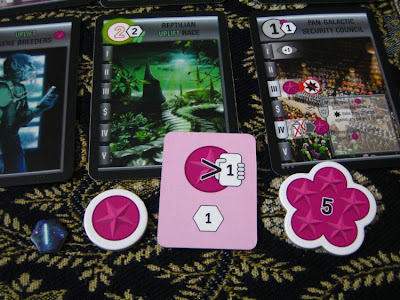 Dominant Species - The big hit which was not as big a hit for me personally. The game is interesting, there are big moves to be made and devastating disasters to try to survive through. The area majority mechanism is not quite my thing. 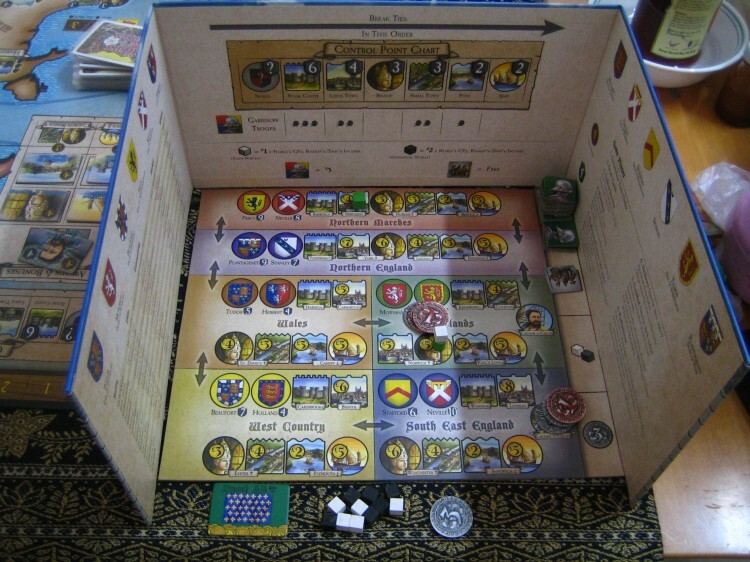 Wars of the Roses: Lancaster vs. York - Good implementation of managing loyalties and betrayals. There's double guessing but I didn't mind it too much here. Deciding whether to be defensive (cheap, but you may be wasting your money) or offensive (expensive, and it's hard for your victim to protect everything, but if you fail, you will waste a lot of money) is interesting. You need to pick where to fight and where to concede. But there's area majority too. Nuns on the Run - Fun and exciting to play a novice. I have not played the nun side yet. Commands & Colors: Napoleonics - I never was a big fan of the Commands & Colors series (Memoir '44, Battlelore, Commands & Colors: Ancients). Don't quite like the cards restricting flank thing. Catacombs - I enjoy it for the novelty. London - Quirky card game that I couldn't quite grasp. I guess I can't really conclude until I try again and understand it better. Dungeons & Dragons: Castle Ravenloft Board Game - Easy to learn cooperative dungeon crawl game without the need for a dungeon master. I'm not a particular fan of the fantasy / role-playing genre, so the theme dosen't do much for me. Navegador - The key seems to be to focus on areas with least competition. Admittedly I have only played two games and there is much space for improvement for my tactics and strategies. I get a feeling I've seen most of what's there to be seen, and the urge to dig deeper is low. The Great Fire of London 1666 - Interesting enough theme, and mechanisms do match the theme, but the mechanisms aren't very interesting to me. Troyes - Feels familiar, a little "been there, done that". And this is despite the not-seen-before dice mechanism. Space Hulk: Death Angel - The Card Game - Not knowing your mission until you reach the last room rubs me the wrong way. Feels like I'm just trying to passively survive and last until the last room, as opposed to going in with an objective and a plan. Wars of the Roses: Lancaster vs. York . Hmm... who among my opponents' followers should I bribe? Which city should I attack? 20th Century - I like the positive message of reducing garbage and pollution. I feel like I've seen most of what's there to be seen. Horus Heresy - I feel quite restricted in what I can do and how much I can move my troops or get them to fight. The game tells a great story though. Tikal II: The Lost Temple - Feels like too many paths to victory that don't quite mesh together thematically. Game is very attractive and production quality is superb. Grimoire - I didn't like the double-guessing. Irondale - I didn't find this construct-buildings-in-a-grid card game interesting. 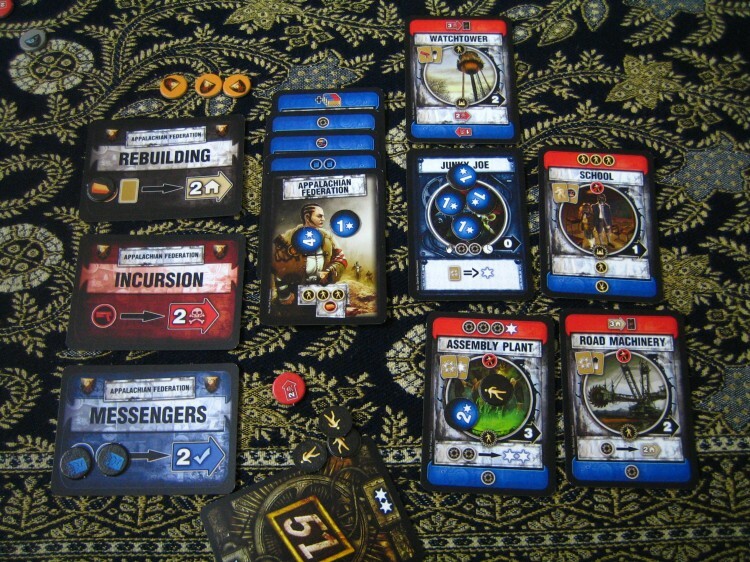 Resident Evil Deck Building Game - It didn't feel very different from Dominion, so my interest is low. Leaping Lemmings - Rules and gameplay require more effort than the light theme suggests. The Speicherstadt - One nifty mechanism wrapped around an uninteresting game. These are not ranked. Just a simple list of what I've played among expansions released in 2010. Dominion: Prosperity - Played on the computer. I like this expansion which expands the strategic possibilities. Dominion: Alchemy - Also played on the computer. This is just OK. Going for cards requiring potions feels like a "Do or Do Not" thing (Yoda), so going down that path feels like taking a different route, as opposed to the base strategies being expanded. Race for the Galaxy: The Brink of War - I'm a big fan of Race for the Galaxy. I enjoy the additional scope, but the deck is getting rather unwieldy. Power Grid: Russia & Japan - More variety for Power Grid. Agricola: Gamers' Deck - I like that the cards are not crazy and are not just a novelty. They feel like they are well thought out and well balanced. Subtle. Hansa Teutonica: East Expansion - I think I have only played it once, Allen's copy. I don't feel I have played the base game enough, so I have not decided to buy the expansion. I find that I feel this way about many expansions. I have not played the base game enough, so even if I like the base game a lot, I feel no urgency to buy the expansion. E.g. Innovation and Echoes of the Past, 51st State and The New Era. Well, The New Era is technically a standalone game, a kind of 51st State v2.0, but I'm enjoying v1.0 well enough and don't love it that much to want to spend money to replace it with v2.0. Race for the Galaxy: The Brink of War. We call the 1 Prestige "cherry" and the 5 Prestige "flower". 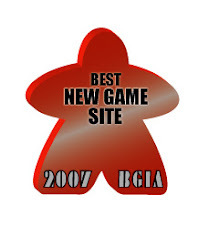 When I browsed www.boardgamegeek.com to do this section, I was quite shocked that there were so many games published in 2010. This list is by no means complete. It's just some of the better known games that I have heard of. Dixit 2 - I have played Dixit. It's fun and lets you be creative. Defenders of the Realm - Low interest. Some say it's Pandemic with a fantasy setting. Age of Industry - I'm content with Brass. Glen More - Some interest to try. Luna - Low interest, because most Stefan Feld games don't click with me. Forbidden Island - I'm content with Pandemic and don't really need a similar but more family-friendly game. Ascension: Chronicle of the Godslayer - Low interest in trying deck-building games. Merkator - Uwe Rosenberg game, but it seems to be doing poorly compared to Agricola and Le Havre. De Vulgari Eloquentia - Allen has it and I have read the rules. Still in the (long) queue to be played. Gosu - I had some interest in this, but it sounds quite confrontational so I doubt my wife will be willing to play. Conflict of Heroes: Price of Honour - Poland 1939 - Sometimes I am tempted to try war games, but I never work up the courage. Asara - I like many Wolfgang Kramer designs. In recent years my gaming tastes have shifted to heavier games, so his new releases don't interest me as much as before, but I still like many of his classics, especially The Princes of Florence. Samarkand: Routes to Riches - If this is similar to Chicago Express, low interest. Poseidon - I enjoy the complexity of 18XX games, so if this is 18XX simplified, low interest. The Rivals for Catan - I have the older Catan card game, which I have not played for a very long time. Isla Dorada - I think Bruno Faidutti is a wonderful guy - good presence on the internet, friendly and responsive; but somehow his games don't click with me. But I like Castle, which is much less famous than Citadels. Antics! - Limited print run, so this is hard to buy. It sounds interesting. Wok Star - Interested to try this real-time cooperative game. Keltis: Das Orakel - They say it's the most strategic of the Keltis family, but I don't play the others enough to justify getting this. Mord im Arosa - You need to listen to cubes falling and guess where they land. Interested to at least try. Junta: Viva el Presidente! - Interested to try. You get to negotiate, beg, bluff, threaten and lie. 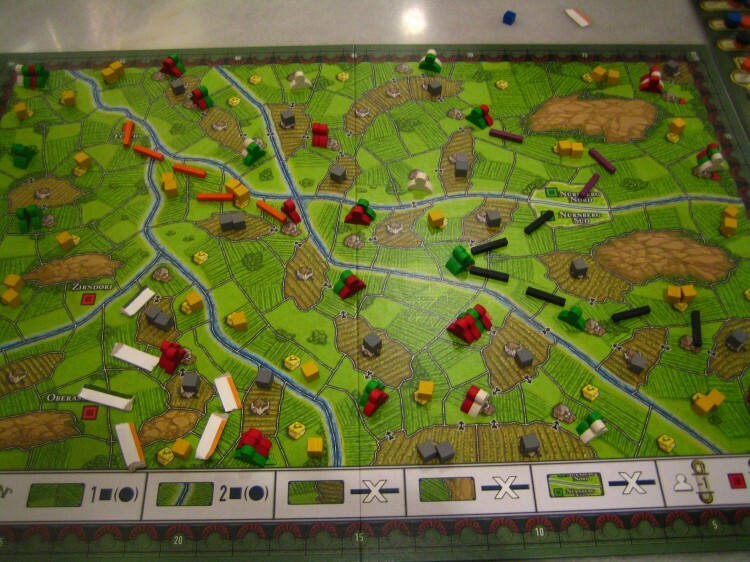 1880: China - I only recently dipped my toes into 18XX games, but this one sounds daunting. Not so soon I think. Prêt-à-Porter - The English version is published this year and it seems to be doing well. Interested to try. The Hobbit - Reiner Knizia cooperative game. Similar to Wolfgang Kramer games, nowadays I tend to be less interested in Reiner Knizia's new games, despite still enjoying many of his older games. Show Business - I followed this game a little because it has rock stars.